We know that the fitness niche is very popular and a very big market. Not to mention, we know these people are more than willing to spend money. 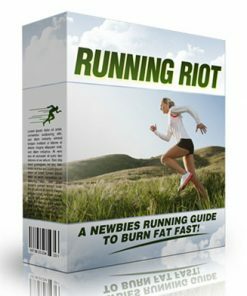 Running is a big sub-niche in the bigger fitness market and it’s getting bigger all the time, with new beginners search for information on how to get started and how to do it right. Here’s where you come in, as the expert providing useful and usable information. All the while your serving quality content, you have the opportunity to make some cahs for yourself. This niche is also a great one to push physical products such ad from Amazon. 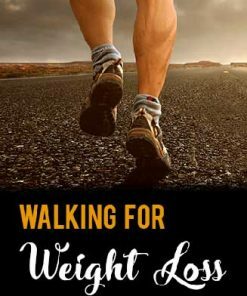 From running shoes to safety gear, you’ll have plenty to advertise. You’ll be getting everything you need to not only build a large profitable mailing list in a enourmous and well paying market, but you’ll have pre-written messages ready to send to your buying subscribers. This package includes everything you need to get started and mail to your list on a regular basis, which means many opportunities to sell them something. It’s a complete package because, you’ll get a well done, ready-to-go Internet Marketing squeeze page and matching confirmation page. Simply insert your Opt-in form, upload the web pages and it’s ready to start building a list for you, and talking to that list, on auto-pilot. You will be getting 12 Pre-Written messages. Add your money links or affiliate links, any links you want for that matter, copy and paste the messages into your Autoresponder series and your done. It’s very simple and easy. 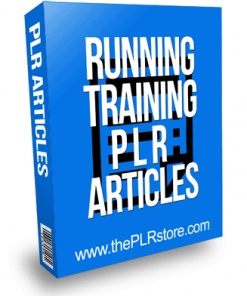 The Running for Beginners PLR Autoresponder Messages are already pre-formatted to 65 charactors per line to save you time, you don’t need to edit the line lengths, it’s already been done for you! These messages are high quality with a large amount of high quality and well written text, at over 8,200 words! TaLK about some content! We’ve even revamped the email Subject lines to help increase open rates. 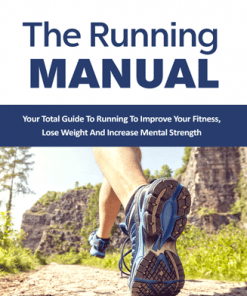 Do you have the right running gear? 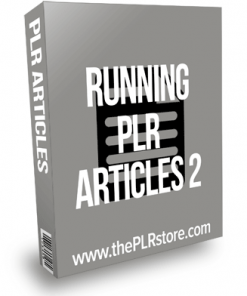 Running for Beginners PLR Autoresponder Messages come in both TXT and Word Doc formatt for easy use. Each email message comes with a closing hook at the end of each message to keep your subscribers looking forward to your next email, which can mean a much more responsive list for you and a much better chance of making sales! You’ll also be getting pre-made Begining Running Clickbank ads you can copy and paste into the messages where you want. Insert your Clickbank affiliate Id and they are ready to go. There are 4 different Digital Products with 4 high quality ads for each product, 16 ads in total. Or you can use your own. You could even try some instant commission programs. Plus, there are Extra Opening and Closing Paragraphs with over 900 words. That’s over 12,000 words of high quality content! No writing needed! It’s already done for you. All extra content comes in both MS Word and TXT formatt, so it’s easy to use. 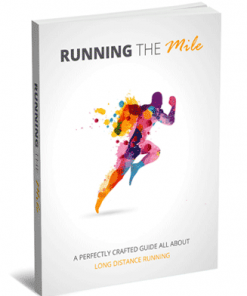 You could use the extra content to create more running for beginners messages. use the extra titles to spicy up your blog posts or report titles, even article titles. 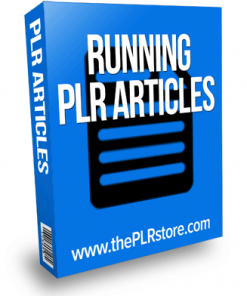 Add the openings and closings content to PLR articles to make them more unique. Use the extra content to drip to your blog. Plenty of uses! The included confirm web page has a related Running Digital Product offer, the perfect opportunity to make some extra dollars while building your list. You could get paid to build your own list! It doesn’t get any better! This package also comes with PSD image files for the so you can brand the squeeze and confirm pages, ebook graphics exactly how you want. Add your name or your site url. You become the expert and guru by branding yourself, which means more trust from your readers. 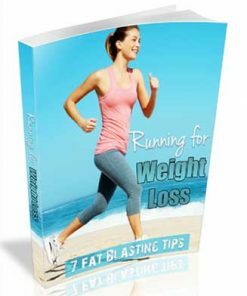 You could use this Running for Beginners Autoresponder message Series as a brand new AR Series or add them to a series you currently have running for extra messsages and even more opportunities to profit from your growing list. Are Your Ready to Take The First Step? 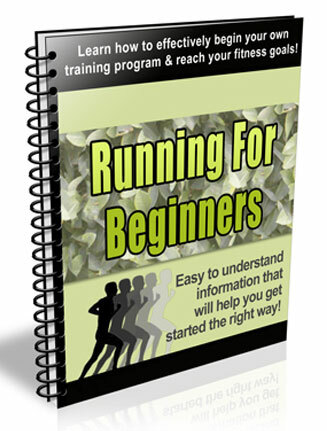 Will Help You Effectively Begin Your Training Program & Reach Your Fitness Goals? 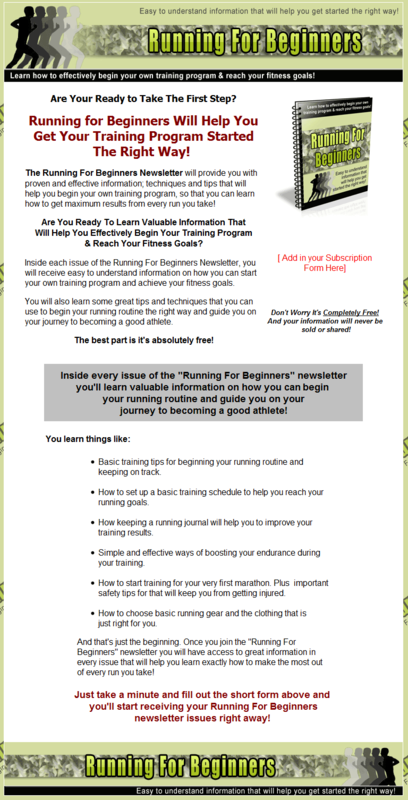 Inside every issue of the “Running For Beginners” newsletter you’ll learn valuable information on how you can begin your running routine and guide you on your journey to becoming a good athlete! And that’s just the beginning. 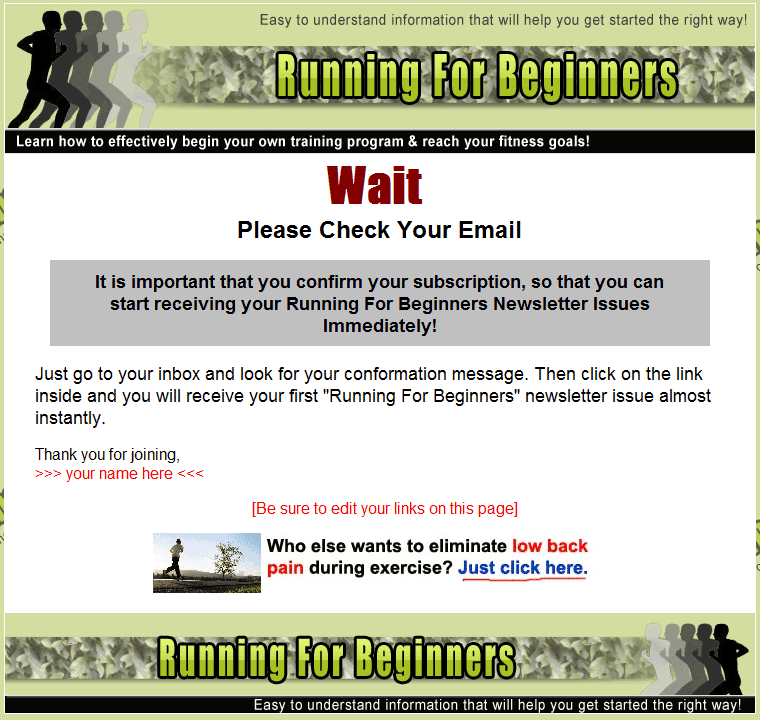 Once you join the “Running For Beginners” newsletter you will have access to great information in every issue that will help you learn exactly how to make the most out of every run you take!